Art may essentially be an act of creation, but annihilation nonetheless forms the dark heart of Bahman Mohasses’ work. In the Iranian artist’s paintings, sculptures, and collages from the 1950s forward—on ample display in the new documentary Fifi Howls From Happiness—all manner of grotesquely knobbed bodies grapple over one another or else all alone in a void, toward something unseen in the distance. Not only do the pieces often seem to depict a world on the verge of obliteration, but many of his public commissions were destroyed under state orders, and Mohasses has torn asunder still more of his own canvases. Director Mitra Farahani tracks down the largely forgotten figure at a small hotel in Rome in 2010, in quiet exile from his native Tehran for more than three decades, giving him the floor to expound upon a convulsive career dedicated to capturing what he calls “the condemnation of existence.” The film that develops isn’t a de facto detective story like so many other recent arts documentaries (e.g., Finding Vivian Maier), but rather a poetic rumination on a modern artist at peace with having roundly rejected the notion of posterity, even as he nears his death—which, it’s revealed early on, happens to occur during the period that Farahani spends observing him. Fifi Howls From Happiness, titled after Mohasses’ most dearly held of his own paintings, is often frustratingly short on context for those not well-versed in the national-historical ground it covers. (Farahani refrains from any straight recapping of the political turbulence that buffeted the irreverent Mohasses in his native country). 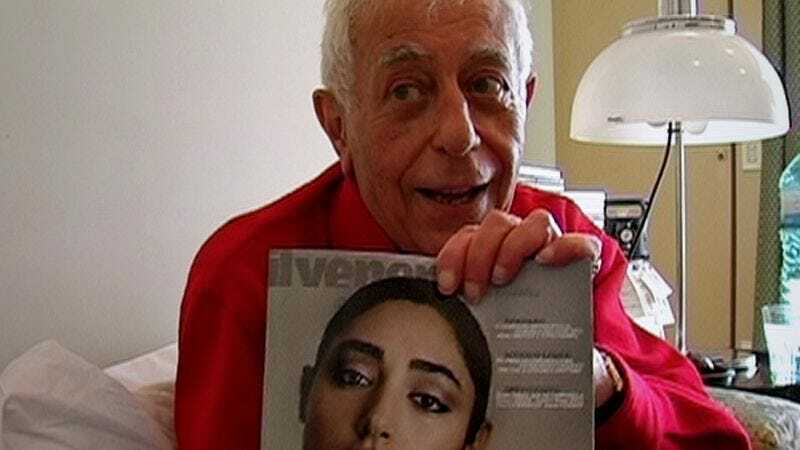 But the artist himself manages to command the viewer’s attention: From the fixed station of his couch, the white-haired eminence becomes a consummate master of ceremonies, punctuating each of his barbed anecdotes with a welcoming wheeze of a laugh, and even instructing Farahani on how best to arrange her movie. She’s all too happy to take his directions—when he says, for example, that his life-story narration should play over a shot of the ocean, she obliges. The doc’s later stretches concern a commission that Farahani herself brokers for Mohasses, after he informs her that she needs to film him in the studio. (The septuagenarian’s most recent output appears to consist of small collages assembled at his desk.) Two brothers, Persian artists who live in Dubai, travel to Rome to seal the deal, spending several days with their heretofore-elusive idol Mohasses, browsing approvingly through his largely as-yet-unseen extant work and even sitting down together to watch The Leopard on DVD. It’s amusing to watch the great artist slip comfortably into full salesman mode, in short order managing to cow his prospective patrons into a 70,000-euro advance, but this unhurried hanging-out footage, of which there is a lot, soon begins to drag, not establishing much save for the alive-and-well reverence of a younger generation. Though Farahani takes care to pose her project as both a portrait of and an intervention in Mohasses’ life, it winds up being considerably less interesting as the latter. With Fifi Howls, she has made an involving documentary that in the final estimation feels a slight bit out of proportion. There is a gripping central figure, and it is imaginative in its execution, cleverly tailoring many of its formal devices around the give-and-take between filmmaker and subject. But the rest of the canvas doesn’t quite feel properly filled in.